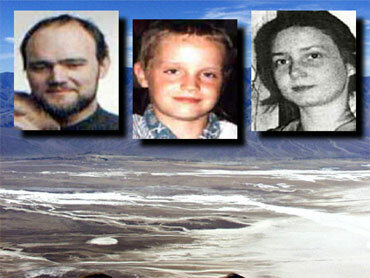 Skeletal remains found in Death Valley may belong to one or more of the four German tourists who vanished in searing summer heat 13 years ago, authorities said Friday. Two hikers discovered the bones Thursday in a remote area of the famous Mojave Desert park. The hikers were search-and-rescue workers from Riverside County but they were off duty at the time, Inyo County sheriff's spokeswoman Carma Roper said. Identification for one of the missing tourists was found near the bones, she said. "We're fairly certain" that the remains are those of one or more of the long-missing visitors, Roper said. However, formally identifying the remains will be a long process, she said. The cause of death also must be determined. "At this point, it's being handled like a criminal investigation ... but there is no evidence of foul play at this point," Roper said. The remains were found southeast of Goler Wash, a rugged area accessible only by 4-wheel-drive vehicles. The area is several miles south of the spot where an abandoned minivan the tourists had rented was found months after they were reported missing. Roper said it would be a relief to solve a mystery that stretches back to 1996. "I know a lot of people have invested a lot of their time and energy and emotions into concluding the case," she said. The park near the Nevada border is considered the hottest and driest location in North America. The four who vanished in the 3-million-acre wilderness on July 22, 1996, were Dresden residents Cornelia Meyer, 27; her 4-year-old son, Max; her boyfriend, architect Egbert Rimkus, 34, and his 10-year-old son, Georg Weber. They had arrived in the United States earlier in the month and were touring in a Plymouth Voyager minivan rented in Los Angeles. They checked out of a Las Vegas hotel room on July 22 and arrived in Death Valley the same day, records indicated. Temperatures in the park that week had topped 120 degrees. The visitors bought an information booklet at the visitor center and then apparently stayed overnight in the park and the next day took a dirt road into a remote area. An entry in German and dated July 23, 1996, was left in a guest book kept in a box on a metal pole in an abandoned mining camp. It indicated the visitors were going through "the pass" - possibly a reference to Mengel Pass, a dirt trail that crosses the barren Panamint Range, a barren mountain range on the park's southwestern border. The entry was signed "Conny, Egbert, Georg, Max." They weren't heard from again. On Oct. 23, the locked van was found mired in sand in a ravine off roadless Anvil Spring Canyon, amid rolling hills at an elevation of 3,000 feet and far from usual tourist routes. Three tires were shredded and one had come loose from the rim. Searchers found a beer bottle a quarter-mile away that appeared to have come from a package found in the van. Inside the van were rolls of exposed photo film, sleeping bags, empty gallon water containers, the Death Valley information booklet and an American flag apparently taken from a stone cabin in Butte Valley, five miles away. No tracks that could have been made by the missing tourists were found. No passports or personal effects such as keys, a purse or wallet were found. A team of 45 searchers, eight horses and four helicopters from California and Nevada law enforcement agencies combed the area but found nothing more.